We are counted amongst the foremost manufacturers, exporters and suppliers of Waterproofing Coatings,Water Proofing Powder,Water Proofing Liquide . These are fabricated using best quality materials and are highly reliable. Our product range is widely used for sealing surface porous, avoiding algae and fungus in various industries. We supply these products to our clients at reasonable prices in the market. These are well known for its features like durability and flexibility. Our business is highly involved in offering a wide range of reliable Waterproofing Products to our valuable clients. We have been a pioneer and market leader in the field of consumer products and waterproof products across the globe. Our range is provided in different sizes that meet the individual requirement of our clients in the best possible manner across the globe. We bring forth an exclusive range of this Waterproofing Systems which is a key solution to protect the internal and as well as external walls for water proofing for Concrete and Plasters materials. We provide these in standard as well as customized specifications as per the requirements of clients. These are made under the supervision of prominent and experienced engineers. Cement Based Waterproofing Plast-O-Proof is an integral water proofing compound ideal for use with both Concrete and Plasters. Plast-O-Proof is based on specialized surfactants and synthetic resin which impart superior flow and cohesive properties in concrete and mortars. Use of integral water proofing compounds in concrete and mor tar is one of the precautions taken to achieve a waterproof concrete or plaster. It is used to waterproof all types of plaster, concrete, cement punning and brick bat coba systems. We are acknowledged for manufacturing, exporting and supplying of our wide variety of these Cleaning Agents to our extreme customers. Cleaning agents are substances, usually liquids, that are used to remove dirt, including dust, stains, bad smells, and clutter on surfaces. Purposes of cleaning agents include health, beauty, the absence of offensive odour, avoidance of shame, and avoidance of spreading dirt and contaminants to oneself and others. With rich industry experience, we are manufacturing a superior quality of Deep Penetrating Sealer. Our offered ranges of this deep penetrating sealer used for bricks, aerated blocks, hollow blocks, clay tiles These are made in compliance with the international quality standards and also all the other relevant material. Our range finds applications in various industries and is offered in various specifications to our clients at cost effective prices. The product is in the form of a clear liquid which is easy to use. It waterproofs all porous surfaces and reduces the water absorption to below 1%. The treated surfaces can be plastered or painted without affecting the performance of the product. We manufacture a diverse range of Elastomeric Waterproof Coating that is manufactured using high quality raw material under the guidance of experts. These are widely used in various applications RCC terrace water proofing, Sealing cracks in asbestos cement sheets and sealing J' bolt openings. Elastomeric Waterproof Coatings are well known for its attributes like flexible and durable. Clients can avail these from us in a wide range at affordable prices at standard norms. With the help of our experts we offer a huge gamut range of Polymeric Waterproofing which is manufactured using premium quality materials. We offer these products as per the need of clients in various water resistant applications for different purposes like concrete and mortar surfaces to prevent leakage and dampness. Our range of this is highly acclaimed for its easy to clean and wash and less maintenance features. Our organization deals in offering an extensive range of this Quick Cement Setting Compound which can also be customized as per the specification give by clients. 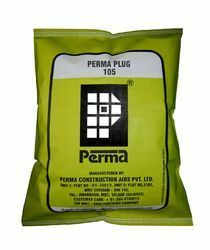 Perma Plug is a quick setting cements and mortar supplied in dry powder form. These are widely used in Heavy Duty Plugging, Repairs of Buildings, and Sealing Joints and are available in good economic prices. Perma Plug, is a quick setting cements and mortar supplied in dry powder form. This constitutes a blend of cements graded sand and chemical set control agents. The product needs only on site addition of required amount of water just before its use. Heavy Duty Plugging : Perma plugging suitable for plugging of pres stressing /protestation holes or depressions in the pipes, sleepers or girders. Repairs of Buildings: Repairs to corners an edges of high strength concrete structures and general repairs in the building industry. Plugging Running Leaks :Perm a Plug is used to stop leaks from water tanks and leaky basements because of its quick setting property. Sealing Joints : Perma Plus can be effectively used for filling joints pointing brick stone masonry and water proofing. Easy to Use: Perma Plug is supplied in powder form. It only needs addition of water be fore use. Rapid Setting : "Rapid setting property of this product make sit useful in stopping running water. High Strength : Perma Plug hardens to a high strength which is comparable to the strength of the member under repair in hours only. Compatibility : Perma Plug is highly compatible for use with all materials,stone,brick; steel etc. Mix Perma Plug and water in the proportion of 3 volumes of powder to 1 volume of water and mix to obtain as tiff consistency paste. We are the prominent manufacturer and supplier of a wide range of Solvent Based Water Repellent to our clients. Our ranges of these are fabricated using superior quality materials that are procured from reputed and certified vendors of the industry. Perma Treat is a color less sol vented silicon based fluid which imparts permanent water repellant effects to the walls; stone brick work and cement painted surfaces. We offer varous types of waterproofing products as per application.Water Proofing Powder Trik is a very strong integral water proofing Powder for both concrete and plaster. Perma Trik is water soluble and form the permanent ingredient of concrete and plaster to make them watertight forever. Perma trik increases workability and helps in achieving dense concrete. 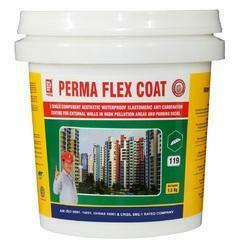 Perma Trik is a very strong integral waterproofer for both concrete and plaster. The product is water soluble and form the permanent ingredient of concrete and plaster to make them watertight forever. Perma trik increases workability and helps in achieving dense concrete/plaster. 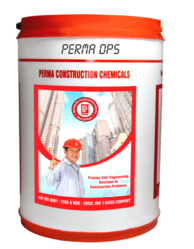 Perma Trik has effective chemical ingredients which waterproof cement permanently. Perma Trik is ideal for concrete as well as plasters. The product disperses uniformly on addition and its effect can be felt in wet concrete itself. Perma Trik is a small investment for building quality structures which need the least maintenance. It significantly reduces water demand to bring down W/C ratio in the range of 0.45 which generally represents a sound concrete. Adhering to W/C ratio in the range of 0.45 . It is emphasized that integral waterproofer and plastcisers only help in making a good concrete better. Hence observance of good construction practices is of utmost importance for achieving the overall goal. 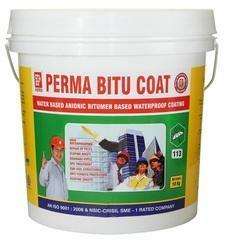 Add Perma Trik in concrete and mortar along with water at the rate of 500 gms per bag of cement. 500 gms/50kg bag of cement. 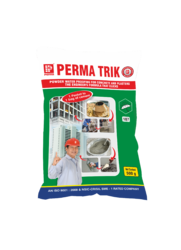 Perma Trik is available in 500 gms pouch & 20 kg bulk packing. Perma Trik has a shelf life of 24 months from the date of manufacture if stored in original packing. and Protection liquids in a wide range of our clients. These are effectively used in arresting nagging leakages and dampness from walls and protecting exposed. Our ranges of products are tested on various conditions in the industry. These are good for its attributes like durability and flexibility. Clients can avail these from us at economical prices in the market. We Manufacturer of Water Proofing Solution, waterproof material, waterproof material, waterproofing chemical,waterproofing admixtures, waterproofing compounds, water proofing, Waterproof Tile Adhesive and solution for Waterproofing, Water Proofing Solution, Waterproofing Solution We have wide range of all constriction chemicals & Water Proofing Chemicals. For Protection of exposed reinforcing steel rods. For water proofing leakages from toilet units and sunk slabs. For water proofing damp walls. As an effective paint additive. For waterproofing porous plaster surfaces. Surfaces to be treated with Perma Shield should be cleaned free from oil, grease and loose particles. All laitance and loose particles should be removed by wire brushing or mechanical scrabbling. All undulations and cracks should be made good using Perma Crackfill or Perma Rapid Repair system. In case of badly honeycombed surfaces, give a layer of screed or plaster to make it worthy to receive the treatment. 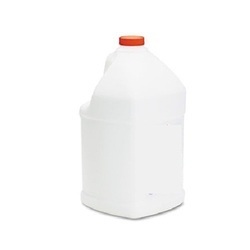 30 to 35 sqft/ltr/coat. Two coats are recommended. 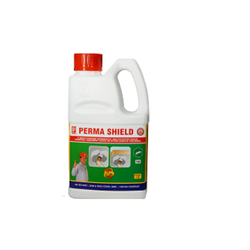 Perma Shield is available in 500 ml, 1 ltr, 5 ltr, 10 ltr, 25 ltr & 100 ltr containers. Our offered ranges of these Water Repellent and Injection Systems are used for the treated surfaces do not allow growth of algae &; fungus hence the building treated does not show the signs of ageing. We fabricate these using superior quality materials that are procured from reputed vendors of the industry. Our range of these products is known for its high quality and durability. Depending upon the needs and demands of the consumers we offer a high range of Waterproofing and Protective Treatments products to our honored clients. This Waterproofing and Protective Treatments provide a protective barrier on porous surfaces, which resists chemical attack and eliminates dust. These are available at clients required sizes and affordable prices. 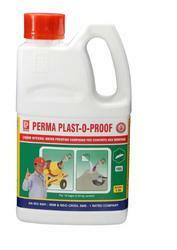 Perma Clear Seal allows concrete surfaces to breath. Al though forming an enamel coating impervious water. Perma Clear Seal allows the escape of water-vapour which could otherwise cause blistering. Perma Clear Seal is water-free. This means that application an take place down to 00C provided surface is frost Vice free. 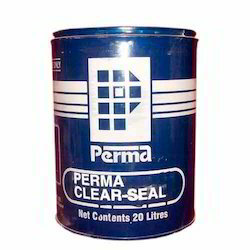 Perma Clear Seal is economical. It gives long life protection at 10% of the cost of an epoxy finish. Can be applied by even an unskilled labour since it is just a brush application. We manufacture and also export a wide range of these waters based Acrylic Waterproof Coating which are fabricated using high quality raw material and with latest technology. Our products are flexible, water resistant coating suitable for waterproofing systems and roof sealing used in conjunction with membranes. This acrylic Waterproof Coating is an excellent adhesion to suitability prepared surfaces. 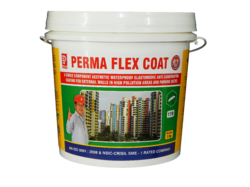 Perma Eazee Coat - SP is used for waterproofing all types of RCC surface such as roofs, parapet walls and external walls. Asbestos cement sheet roof can also be waterproofed using scrim cloth or nylon mesh at the junction, overlaps and J – bolts as reinforcement. Perma Eazee Coat - SP is applied directly from the can. Eazee Coat - SP cures to give a permanently flexible and resilient smooth surface' resistant to a wide range of temperature. Depending upon the needs and demands of the consumers we offer a high range of RCC Waterproofing products to our honored clients. We hold experts and also go through the guidance of our experienced professionals who provides complicated advices that helps to get knowledge in offering these waterproofing solutions. These are available at affordable prices to our clients across the globe. Sealing leakage through cast iron, asbestos or stoneware pipes. Coating on bridge girders and under deck waterproofing of bridges. Sealing cracks in asbestos cement sheets and sealing 'J bolt openings. Coating on leaky plaster surfaces. Clean the area to remove all loose particles, oil, grease and any such deleterious products and wet it with water. If the surface is rough mix Perma Guard liquid and water in the proportion of 1:2 and brush apply on pre wet surface. consistency slurry. Avoid part mixing the ingredients of packing. Brush apply Perma Guard slurry on the surface to be treated. Immediately cover the treated surface with cement sand 1:4 plaster or screed concrete and cure normally. We are highly engaged in offering a huge range of Waterproof Your Terrace / Terrace Waterproof Coat service to our valuable clients. Our service helps in compelling and vibrant showcasing of the company attributes to the entire market. Our range of these waterproof coatings is widely used in newly constructing buildings such as shopping complexes, residential buildings. Our products are preferred for its fast and convenient, suitable back up functioning and also for its promptness and reliability. Note: Stir the material well in the container before use. 20 sqft per kg when applied neat. 13 to 15 sqft/kg when applied with a reinforcement. 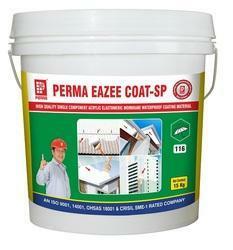 Perma Eazee Coat is available in 500 gms, 1.5 kg, 5 kg, 10 kg, 15 kg & 50 kg packs. 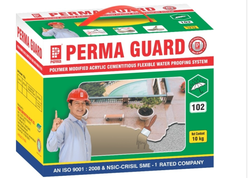 Perma Guard is a polymer modified cementitious acrylic Water Proofing system with a very wide scope of applications in water proofing and corrosion inhibition situations. Perma Guard is a two component material which forms a flexible membrane upon curing. We have gained vast expertise in offering a better-quality range of Water Resistant Coatings that are manufactured using top quality raw materials which are sourced from certified vendors in the market. These are mainly used in buildings for external walls. They are well known and widely appreciated for their quality, easy installation and precise dimensions and this is Eco friendly. We offer a wide range of Acrylic Protective Coating to our customers at comprehensive prices. We manufacture and also export this wide variety range of coatings with high quality to our valued clients across the globe. Our products are an Eco friendly acrylic protective coating for external walls which protects the walls from algae, fungus, polluting the atmosphere and make them waterproof. Terrace Waterproofing is a milky white liquid which can be brush applied to most structural surfaces to make them waterproof. The coating is UV stable and highly flexible. Clean the surface to remove all loose particles and any deleterious matter. Repair all cracks, honeycombs and blemishes from the concrete surface. Brush-apply Eazee Coat primer on the entire surface liberally. Primer is prepared by diluting one part by volume of Eazee Coat with one volume of water. When the primer coat is just dry apply the second coat running the brush perpendicular to the first coat. Provide fibre-glass or scrim fabric at junctions of vertical and horizontal surfaces after one coat then apply the second coat. 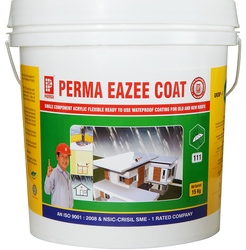 Perma Eazee Coat has a shelf life of 24 months if stored in manufacturer’s original packing in a cool and dry place away from moisture and heat. We are the prominent manufacturers and suppliers of a wide range of Weatherproof Elastomeric Coating to our clients. We offer these in various specifications and can be properly customized as per the specifications provided by the clients. Our ranges of these are fabricated using superior quality materials that are procured from reputed and certified vendors of the industry. Prema Wall Guard is used to provide a water proof and weatherproof coating for the external RCC walls as well as masonry walls. Prems Wall Guard is applied to external surfaces to make them resistant to algae, fungus, carbonation, UV and IR rays from the sun. Prema Wall Guard is used to make the external colored finish long lasting. Perma Wall Guard is water based, hence easy to apply with brush, roller or airless spray and is non-toxic and environment friendly. Per Wall Guard can be built up to thicknesses and with proper rollers architectural texture finishes can be achieved. Perma Wall Guard makes the surfaces algae and fungus free and protect the RCC walls from carbonation attacks. Perma Wall Guard is highly flexible and elastomeric. The film has an elongation of 250% at break and has ability to bridge cracks up to 1 mm when applied to a thickness of 300 to 500 DFT. 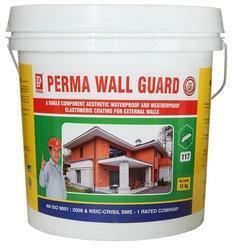 Perma Wall guard can be applied on damp surfaces. Perma Wall Guard is alkali stable and resistant to resistant to UV and IR rays from the sun.